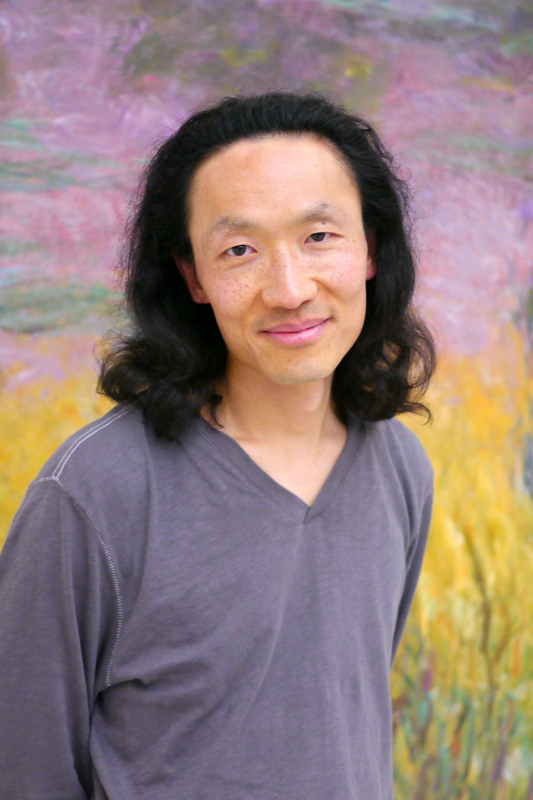 Sung J. Woo’s short stories and essays have appeared in The New York Times, PEN/Guernica, and Vox. He has written two novels, Love Love (2015) and Everything Asian (2009), which won the 2010 Asian Pacific American Librarians Association Literature Award (Youth category). In 2014, Everything Asian was chosen for Coming Together in Skokie and Niles Township. A graduate of Cornell University with an MFA from New York University, he lives in Washington, New Jersey. The New York Times Magazine: Lives – Like Father? Hey Sung- Congrats on the publication of your novel. I am reading some of your stuff here and absolutely LOVING it! I KNOW that both my brother and my best friend will certainly appreciate the humor and frankness of your voice. ps- although I’ve always lived in NJ, the Peddlers Village holds fond memories of childhood for me too! The best debut novel I’ve read since…well, since ever. I had no idea it was your debut novel until I glanced at the blurbs on the cover. Wonderful writing, wonderful characters. Well done. @Karen — You are entirely too kind. I’m in Ithaca, NY, for the weekend, to attend my reunion and sell the book at the campus store. A girl who must’ve been ten or twelve came up and actually convinced her mother to buy her my book, so hopefully she’ll enjoy it as much as you did. Thanks for being a reader! Wonderful novel! When I finished the book, I missed David, Susan, Emma and even Harry. Being half-Korean, it was a treat to slip into a book with experiences that were similar to mine…any sequels planned? Thanks for your kind words. Not exactly a sequel, but I am currently working on novel #2, which features a pair of Korean-American siblings in their early forties/late thirties. Not exactly certain where it’ll all lead, but that’s the fun of it (at least this is what I tell myself to keep going!). I just finished “Everything Asian” literally 2 minutes ago and loved it! I started reading it at work (Borders) and it elicited a few giggles from my coworkers (who already think I’m a walking stereotype) but this time I didn’t care because I really enjoyed it. I hope you write more soon! I’m so glad you enjoyed it. That’s my #1 goal for writing — to keep readers entertained. It’s the least I can do for the time you take to read it. I’m glad you enjoyed it, Jane. I enjoyed writing it! I’ll be in the vicinity of Ithaca in a couple of weeks, when I head over to Wells College for a reading. Driving up I-81 during this time of the year was something I looked forward to when I attended Cornell — the foliage is just incredible! I really enjoyed your book! I learned so much about the Korean culture from the stories. I was wondering if Peddlers Town ever really existed. Looking forward to your next book. Thanks for liking the book! Peddlers Town did indeed exist — it was called Peddlers Village. You can find out more about the back story of the book right here. I’m about halfway through book number two. Wish me luck! Jane, there’s no greater compliment for an author than to have a reader remember your work, so thank you, thank you, thank you. You made my day! Mr. Woo, I really enjoyed reading your novel Everything Asian. Not only did I learn allot about the immigrant experience, being a Native born U.S. citizen and non-Korean, this was one of the funniest novels I’ve ever encountered! I did have a question about the way your characters were introduced and I hope you can share your thoughts with me. I noticed that characters, which I assume are “white”, are never introduced as such. I make this assumption because all of the other characters are identified as non-white. For example: Joon-a’s three friends (p.41) not named; the bad boy in the store and his mother (p.55-59), although we are told he had blue eyes. The woman who owns A Touch of Asia (p.72) her race is not named. John Reeves (p.65) the instructor is not named but the students in the class are named – Asian, black and Indian (p.165). Arnold, from the TV show, is described as “the little black kid” yet when Three’s Company is mentioned the whiteness of its cast is are not mentioned (p.109). Other examples a “Latino man” is mentioned (p.43) an “old black lady” (p.72), a “Chinese women” (p.85) then there is someone described as an “American women” (p.85) is this a white person white? Is there a reason that only non-whites are identified? The way the characters are introduced assumes a white normatively is that your intention? Again it was a great read! I’m so glad you found the book to be funny. It’s not something I actively tried to do, but I think there are moments of chuckle-worthiness, so I’m very thankful for that. As per your question about the lack of identification for white folks, honestly, I had no idea that I did that. I suppose you are correct, that I’m considering white Americans to be the “default” race and did not mention it. Strange, isn’t it? I never would’ve even given it a thought until you brought it up. Haven’t had a chance to read your book but will try to get it soon. But I read the 2 NYTimes articles and wow, really wonderful to see what you’d written. I understand man and it was put out there so nicely. I have 2 daughters who are 1/2 KA and they know all about Korean Americans through me their mom but haven’t had many other occasions to have this experience since we live outside of the US. So I’ll work on getting the book for them as well. Another KA experience for them has been watching DVDs of the Gilmore Girls TV series. I can’t tell you how nice to have people who’ve gone through similar experiences see their own lives in my book. It’s one of the reason why I wrote it, so to actually have that effect — well, I can’t ask for anything more. Thanks for being a reader! Loved, loved your book. I hope you have a more in the works. How much of this book is biographical? i read in an article you wrote for NY Times that you actually have 2 sisters, not 1. I’m very sorry to hear about your Dad. As an Asian, I have struggled with the same feeling of disappointment in my parents and fail to see how hard their struggles must have been. Thanks so much for being a reader! The setup of the book is pretty much from my life. If you haven’t had a chance to read my backstory, check it out. I am indeed writing book #2, which is inching ever closer to the finish line. My hope is that the first draft will be done before the year is out. Wish me lots and lots of luck. Like a truckload. You have a wonderful talent of letting your personality shine through your words, I think you must have a terrific sense of humour along with that sparkling wit – it even shows in your twinkling expression in the photo! I always enjoy to see other immigrant perceptions of life in America, I think we all have hilarious stories in that regard. Your stories brought to mind the excellent Korean dramas I used to watch on television, I loved those programs so much. I thoroughly enjoyed the book and look forward to your next one. Thank you so much, Lorie, for your kind words! I agree with you 100% — immigrant stories are not bound by immigrants alone. The feeling of being out of place is something that so many people share, every day. Glad you enjoyed the book — I’m doing everything I can to get the second one done. Wish me luck! I’m more than halfway through your book and find myself chuckling out loud frequently. My mom came to the U.S. from Mexico and I was raised with her old-country way of doing things. Although I’m very American, I always felt like a bit of an outsider looking in. I love immigrant stories, and for some reason, Asian ones in particular. I think my mom’s way of doing things was more in line with Asian ways than Mexican ones. Well I could go on and on about that, but I just wanted to wish you luck on writing your 2nd novel and thank you for the joy your first one is bringing me. Thank you so much for letting me know how much you like my book! From what I can tell, immigrant stories are pretty universal, not only between other immigrant cultures but even non-immigrants. Seriously — I think everyone can relate to being a fish out of water at some point in there lives. Thank you also for your good wishes regarding my second novel, which is still going…and going…and going. I can use all the help I can get! Hello Sung. I am using your short story, “Paris, at Night” for an English essay I am writing. I really enjoyed the story and was hoping that you might be able to answer a couple of questions for me. Where did you get your inspiration for the story? Have you written any other similar stories? Any other information you could share with me about this particular story is greatly appreciated. Science fiction is not my forte, so I haven’t written anything else in this vein, though I do have a novel I’m writing that’s somewhat scifi-ish. I think I discovered a fantastic new author I need to check out! 🙂 I enjoyed your articles and am curious about reading your books. I’m the daughter of immigrant parents and was born and raised in the NYC suburbs in NJ. I loved reading about your perspectives and we have much in common from being the product of immigrants raised in two cultures simultaneously to being childless in a world where there’s a certain amount of negative stigma associated with that. Looking forward to reading more of your works! Hello right back to you! I’m so glad you jibe with my writing — I’ve written a number of essays for the New York Times, so if those are up your alley, then there’s a pretty good likelihood that my novels may work for you, too. Thanks for stopping by. Greeting from Seoul! I just finished “Everything Asian” that I found at the Yongsan Garrison Library. I work with a lot of Korean-Americans and it was wonderful to read what may have reflected some of their experiences. As the foreigner in Asia, it was great to read a book that talked about home while I am overseas. It really knocked my socks off, from the title reminding me of pan-Asian good stores where some of the customers don’t know the difference or care about the difference in each Asian country’s culture and art to the fact that the novel not only covered the immigrant experience of others with Dmitri Popov, but also issues that were not really discussed in the ’80s, like ovarian cancer and the way the McManus men found sexual pleasure (there’s a run on sentence for you). The variety in the male and females voices, the perspectives from people at different stages of their lives, the physically challenged character, the dark and light made this book such a pleasure to read. Here, I have only been able to find very few novels in English about the Korean-American experience and this is definitely one of the best. 감사합니다 for such an excellent work that brought me home while I am away from home while I make Seoul my hometown. It was truly a pleasure to read “Everything Asian” and I can’t wait to explore more of your work. Thank you so much for your kind words! How fantastic that you were able to find a copy of my first novel in my homeland. As it turns out, my family and I will be visiting Seoul in May — it’ll be the first time I’ll be back since I made a very brief visit in 1994, so it’s been a really long time. After watching some of the Olympics, I’m quite excited to return!